Preheat the kitchen appliance to 220˚C/425°/Gas Mark seven. Place an outsized skillet over a medium high heat and add a drop of oil. Fry the bacon and sausages till golden brown on all sides. take away to a plate lined with room paper. 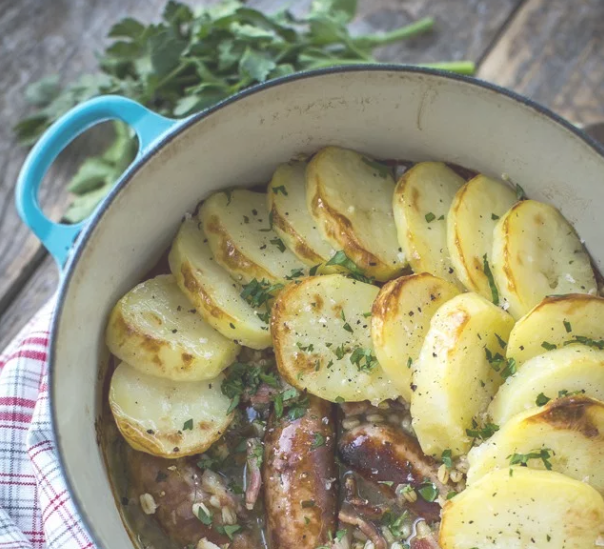 Place the onions across the bottom of a casserole dish, layer up with the herb, bacon and sausages, barleycorn and end with a layer of potatoes. Pour over the stock and place the pot, covered, over a high heat and convey to the boil. Lower the warmth and simmer for half-hour. Remove the lid and dot the potatoes with butter. Season with ocean salt and ground black pepper and transfer to the kitchen appliance and cook for quarter-hour or till the potatoes flip golden brown. Serve generous ladleful’s of the stew in deep bowls with parsley and crusty bread to mop up the juices. 0 Response to "Dublin Coddle with Pearl Barley"